Nader Habibi is the Henry J. Leir Professor of Practice in the Economics of the Middle East at Brandeis University’s Crown Center for Middle East Studies. His current research project is focused on labor market conditions for university graduates in the Middle East. He also maintains a website on issues of underemployment and overeducation in developing countries (www.overeducation.org). 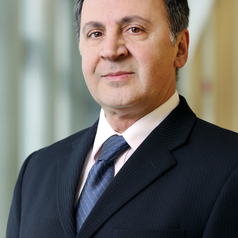 Before joining Brandeis University in June 2007, he served as managing director of economic forecasting and risk analysis for Middle East and North Africa in Global Insight Ltd. Mr. Habibi has more than 25 years of experience in teaching, research and management positions; including vice-president for research in Iran Banking Institute (Tehran), assistant professor of economics in Bilkent University (Ankara), research fellow and lecturer on political economy of Middle East at Yale University. The author of one book on bureaucratic corruption and several articles in refereed journals; he earned his Ph.D. in economics at Michigan State University. His most recent research projects include an analysis of the excess supply of college graduates in MENA countries, impact of economic sanctions on Iranian economy and the impact of Arab Spring uprisings on economic conditions of the affected countries. Habibi also serves as director of Islamic and Middle East Studies at Brandeis University. He has recently published a work of fiction about Middle East geopolitics titled: Three Stories One Middle East (2014).